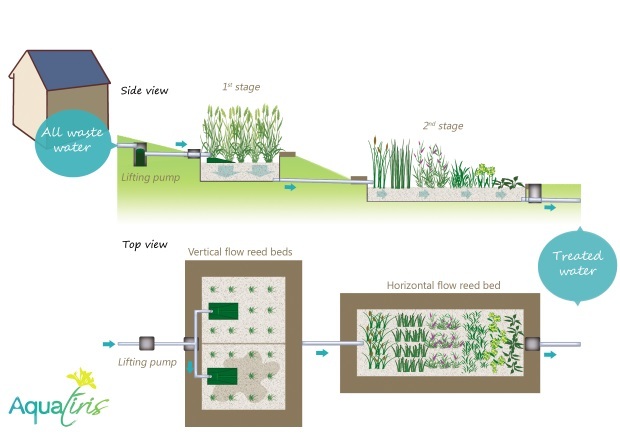 Aquatiris designs and installs systems that treat wastewater with plants. These systems, approved by the French Department of Health and Environment are individually adapted to the number of users, the nature of the soil and the type of toilets (‘classic’ WC or dry composting toilets) and also owners’ wishes in terms of landscaping. Your Aquatiris design office will help you arrive at the solution that best suits you. Our system for treating wastewater with plants is the only such system that has completed and passed the long protocol since the publication of the French decree of September 7th of 2009. The results show that our system is reliable and robust: during the trail they [performed flawlessly, even in difficult conditions such as alternating stopping and restarting, with working under capacity and then 200% overload for 4 weeks, to simulate real-life conditions of changing occupancy and intense use.